A stellar year of international rugby sevens is just about to get even better as the Asian Games in Jakarta, Indonesia, follows on from the Commonwealth Games and Rugby World Cup Sevens in providing a high-profile and incredibly competitive showcase for the sport. Twelve men’s and eight women’s teams will take part in the competition set to be hosted at the Gelora Bung Karno Stadium from 30 August to 1 September and, according to Japan men’s coach Kensuke Iwabuchi, the three days of competition will act as an early dress rehearsal for the Olympic Games on home soil in Tokyo in 2020. 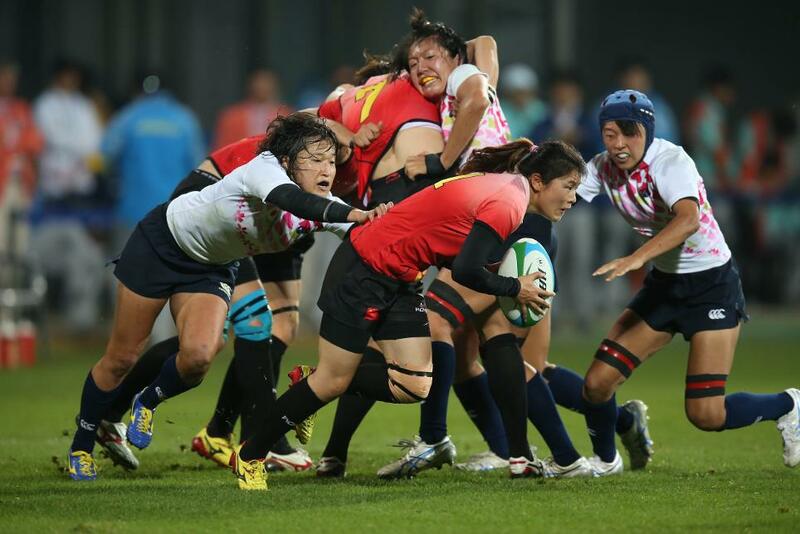 “All the teams in Asia, except Hong Kong who are still bidding to go to the Rugby World Cup in 2019, have set their focus on the 2020 Olympics and they are strengthening their sevens game with the full support from their respective countries,” said Iwabuchi. “Last year when we played the Asian Series, we won one of the three rounds. Now we would like to become the champions of Asia (for a fourth time) and move on to the Olympics to play Tokyo 2020 as the Asian champions. We want to take the gold medal back home. Rugby sevens has been part of the Asian Games since 1998 and in the men’s competition Japan have been dominant, winning the last three gold medals on offer, in Incheon in 2014 when they scored 289 unanswered points on their way to the final against Hong Kong, Guangzhou in 2010 and Doha in 2006. Korea won gold in the 1998 and 2002 Games. Japan go into the 2018 edition on a 17-match winning run at this level and find themselves in Pool B with Malaysia, Chinese Taipei and hosts Indonesia. Malaysia will be one of Japan's opponents in Pool B and like Sri Lanka they both played at the Commonwealth Games on the Gold Coast back in April. Sri Lanka have named an identical squad to the one from the Commonwealth Games and, along with two-time winners Korea – the only team to win a medal in each of the six Asian Games' tournaments held to date, they look most likely to compete for the top two spots in Pool C. No doubt the United Arab Emirates and Afghanistan will be determined to have their say, too. Despite not winning a match on Australia's Gold Coast, the Tuskers took the lead in all three of their matches against Fiji, Uganda and Wales. For Pakistan, who finished 11th on their Asian Games debut in 2014, the opportunity to increase awareness of the sport back home is just as important as results. “With the whole world watching the Asian Games, I think it will be encouraging for every Asian country to take on this amazing sport and especially for us to showcase to our country what is possible,” said Pakistan captain Kashif Khawaja. Having been drawn in a tough-looking Pool A alongside Hong Kong, runners-up in 2010 and 2014, China and Thailand, Pakistan have their work cut out to make it through to the knockout stages of the Cup competition. China are the defending champions in the women’s event having swept all before them in 2014, winning all six matches and scoring 202 points and conceding only 31. Japan ran China mighty close in last year's final, though, and would have won had Yoko Suzuki’s try right at the death not been ruled out for a forward pass to allow China to hold on for a 14-12 victory. They are expected to present the biggest challenge again with the Sakura Sevens hoping to build on their Challenge runners-up finish at RWC Sevens 2018. “Our team has taken a step up by playing at the RWC Sevens, and I hope we can show the areas we progressed in such as communications and decision-making,” said coach Hitoshi Inada. Inada says he expects another close encounter if the two teams come together again. Four years on from their gold medal triumph, China – who will replace Japan as a core team on the HSBC World Rugby Women's Sevens Series in 2019 – find themselves paired with Hong Kong, Singapore and Korea in Pool A.
Kazakhstan, bronze medallists in 2014, Thailand and Indonesia accompany Japan in Pool B. This is the third time women’s sevens will be played at the Asian Games after being introduced in Guangzhou in 2010 when Kazakhstan won gold.